In Grand Tactician: The Civil War (1861-1865) we are building a complex economy model that will work in the background of the game. The idea is to allow player utilizing the industrial power of his/her nation, and targeting the enemy economy. For example railroads allow fast movement of troops and supplies across the states. This means destroying the enemy’s rail network will hamper his mobility and flexibility in troop concentration. Rail lines can of course be repaired, so maybe it’s more important, in the long run, to make it impossible to maintain the rail network? When the gears of economy stall, it will become impossible to keep up momentum in the military operations as well. Here we take into account the feedback from players of Oliver’s previous strategy game The Seven Years War (1756-1763). In the title, the economy model works well, but it’s not very intuitive for most players. Many players felt that the model needed too much micromanagement from the player, making the campaign game play burdensome, especially to players who wished to run military matters only. To make things work smoothly, we let the markets run the show, allowing the player to influence the system with more macro-level controls. For example, you have your domestic production, trade and import/export. While supply and demand determine what is being produced, and where it is being sold to, the player can manipulate the system by government sponsoring and trade policies. As a historical example, playing as the south, cotton is the main source of income and the exports can cover costs of importing other goods needed to run the nation. But what if you’re blockaded and cannot produce the weapons and ammunition needed? In the end, instead of TSYW-like interaction with economy, production and markets, things should feel a lot different, even if the mechanics working in the background are somewhat similar. Instead of player building up industries, managing upgrades and workforce, prices and minimum stock level, this time around an industry will expand, upgrade, hire or even shut down depending on markets, available workforce amount & type, and of course profitability. Another change is the way goods are moved around. In TSYW, state sponsored traders move the goods, “item” at a time from A to B. The amount of traders is limited by market size in the province in question. Depending on prices, supply and demand, and player’s priorities, certain goods are moved first, while the others wait for available traders. This often results in high-profit goods, that maybe are irrelevant to player’s ongoing war effort, being prioritized, and local shortages being created. Player is able to manipulate and optimize the system, but it required understanding and micromanagement, like setting up minimum supply levels and manual prioritization – and this per province. Sometimes adding too many building projects could stall any development for a time. And do I need to mention Prussian loam to any TSYW-veteran? This is where many players became frustrated. But you’re more interested about the link to war, from the military commander’s point of view? Economy Concept Example – Supplying an Army. In the above concept image, let’s have a look at what it takes to keep an army supplied. In the game, armies are supplied from supply depots. The supplies carried in the armies’ supply trains won’t last forever. Lack of supplies will lead to regulation, which will lead to increased sickness and desertion, and foraging the countryside, which will affect the population’s support and readiness of the armies, and so on… In short, you want to keep the armies well supplied (and enemy’s not so). When setting up a camp or entrenching, the army will be replenished from the appointed depot. Range to base of supplies is of importance, and this will mean that sending armies deep into enemy territory like in many other strategy games, without proper means of supplying them, will end up in a disaster. An army needs a wide range of supplies. Arms, ammunition, horses, food for men and the beast alike, uniforms. These need to be produced or imported, and here economy and industries will play a key role. For example, to produce the needed artillery in an iron works, you need iron, wrought iron or bronze, that are produced in a foundry, that need the raw materials from mines, and so on. 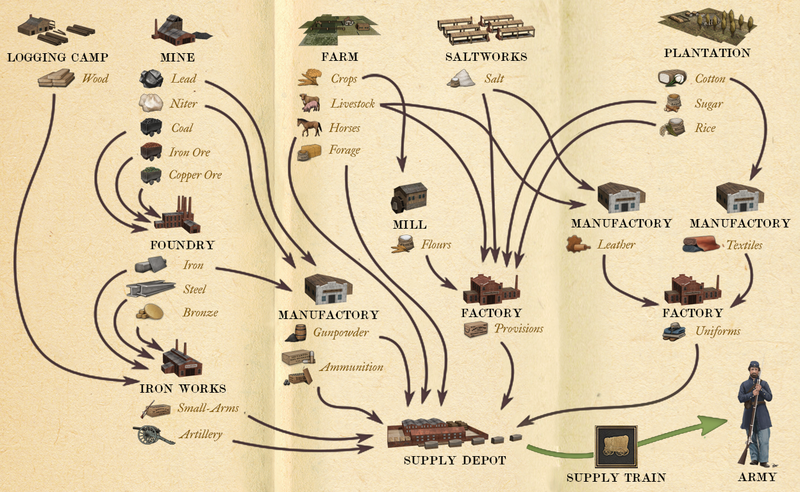 In the concept image, you see some of the industry types in the game. If you’re familiar with Civil War history, you know that the south had many shortages in available goods, and the north tried to further increase the effect by attacking the production. Salt is a good example. It was mined, or produced in saltworks, and was important for food preservation and curing leather. Virginian saltworks in Saltville were attacked by Union in 1st and 2nd Battles of Saltville. Sherman is noted saying “salt is eminently contraband”. In Grand Tactician, targeting production capability, like salt, works like it did during the war: if the nation runs out of salt, prices skyrocket, and soon there will be severe hiccups in food and leather production. This will affect the armies, and their capability to maintain effective operations, as provisions are no longer available. To fix the situation, the targeted nation will need to divert funds to restore salt production or to import salt. Funds, that would be direly needed to pay the troops or repair the raided rail network, etc. So the production facilities and trading infrastructure are important targets to military actions, such as raiding and blockades. But the transportation network, in form of IIPs and railroads, can also be targeted, in any point of the shown chart (the arrows). If attacking the supply depot itself is out of the question, cutting the supply route carries the same effect. Pushing into enemy territory, for example capturing choke-points in the road network, means the flow of goods will stop, or need to be diverted. And taking this a step further, you can see how the historic strategies, such as controlling the Mississippi to cut the Confederacy in half, along with strong blockade, can be implemented in Grand Tactician to achieve the goals of Scott’s Great Snake. Money Isn’t Everything, but Everything Needs Money. Before the Civil War, Confederate Lieutenant General Nathan Bedford Forrest made a fortune as a slave trader, a planter, and by investing in real estate. Forrest spent his own money to help his men acquire supplies. – 501 Civil War Quotes And Notes. Our plan is to make the economy an important tool in the Grand Tactician’s toolbox of strategies. But at the same time we want to keep economy in the background, without the player needing a degree in economics, or forcing him/her to micromanage the details – especially when the player most likely will like to concentrate on matters of sword instead of the plough. When executed military operations produce believable and foreseeable effects in the enemy’s system, including economy, we believe we can better grasp the essence of the American Civil War. Please post these updates on the Steam page!